Under EU laws, Stilton cheese can only be made in the three counties of Nottinghamshire, Derbyshire and Leicestershire, but a pub in the Cambridgeshire village of Stilton is on the warpath to get the rules changed. The Bell Inn has started making its own version of the famous blue in an effort to be included in the Protected Designation of Origin (PDO), which currently limits who can make the cheese. Stilton-based amateur historian Richard Landy and Liam McGivern, owner of the Bell Inn, have long argued that historical evidence shows the cheese was once made in the Cambridgeshire village and it should therefore be included in the PDO. The pub, which used to be an important trading post for Stilton cheese, has now started producing cheese to a Stilton recipe in an effort to get the PDO changed – a process that requires them to prove they make the cheese commercially on a regular basis. Legally the cheese cannot be called Stilton, but will instead be served in the pub under the name Blue Bell. The first batches of the cheese, made to a white Stilton recipe, were produced in the pub's kitchen at the beginning of February with an official application to Defra to amend the PDO due soon after. “We're starting on a small scale, but hopefully we can scale up production and make the cheese available to others,” said Landy. Historians have long thought that Stilton cheese was named after the village of Stilton because that is where it was first sold, with production taking place in Leicestershire. However Landy says his research proves the cheese did in fact originate in the village in the early 1700s and was made there for many years before its production gradually shifted to Leicestershire and beyond. Nigel White, chairman of the Stilton Cheesemakers' Association, said that he was “not convinced” there was a strong case for changing the PDO. 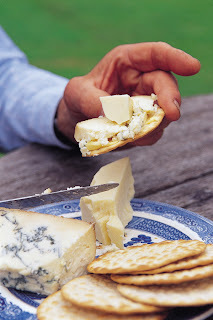 He argued the new historical evidence showed that a cooked, pressed cream cheese was once produced in the village – a very different product to the semi-hard, uncooked, unpressed blue veined Stilton.